Deciding to seek additional in-home care for an aging parent is a difficult but important decision. It is a step that could not only drastically improve the daily life of a loved one, but keep them much safer as their needs change. 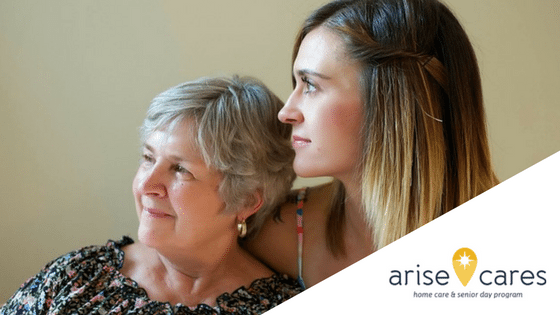 Watch for these signs that your parent needs extra help in the home from a service like Arise Cares. If your parent is constantly forgetting things like where the keys are, how to work the microwave, or forgetting their medication, you should consider in-home assistance to guide them through their day and help remind them to take their medications. Not eating can be caused by a number of issues. Elderly people can have trouble preparing meals for themselves, they may experience tastes differently, have GI issues, or have a loss of appetite, while patients with dementia can sometimes forget to eat. Check the refrigerator and the pantry. Is there old or spoiled food that hasn’t been thrown away? Is there minimal food or only unhealthy foods available? Your loved one may need help with preparing meals and cleaning up the kitchen, which will ultimately keep them safer and healthier. It may be getting difficult for your parent to navigate and clean their home without help. Vacuuming, dusting, or mopping can be too hard and these tasks can become neglected for long periods of time. Falls are the number one reason for ER visits among those over 65, often caused by poor balance, eyesight problems, decreased muscle strength, or arthritis. If your parent has fallen, or you see fall risks around their home, such as difficult steps or uneven thresholds, they may need additional help navigating the home. People with dementia can forget to bathe, brush their teeth, or change their clothes. It may be overwhelming to make decisions regarding what to wear or to complete a task, such as laundry. Luckily, these are tasks that an in-home professional can easily assist them with. Operating the car can be a big challenge as reaction times, eyesight, and spatial awareness worsen with age. If you see dents or scratches, it could be a sign that driving is no longer a safe activity for them or other motorists. Finances can be overwhelming and confusing, especially when so much is managed online and requires passwords. If bills have been neglected or ignored, someone needs to help take control of mom or dad’s finances to avoid services being turned off or more serious repercussions. Arise’s Home Care Program provides companion care or personal care services to seniors or adults throughout Central Minnesota. Their circumstances may include age-related illness, dementia or memory-related conditions, heart disease, diabetes, cancer, or any chronic condition. Our goal is to help your loved one maintain independence, better manage their illness, injury, or condition, and enjoy a richer quality of life. Request more information about Arise Cares’ service here.